To a can of condensed cream of mushroom soup, add ¼ can white table wine or ¼ can water and 1 tablespoon lemon juice, 4 tablespoons grated Parmesan or Romano cheese, a pinch of dry mustard or ½ teaspoon prepared mustard. Heat in the top of a double boiler, add 2 to 3 cups lobster meat, cut into good-sized cubes. Place in a shallow buttered casserole or in lobster shells. Sprinkle with cheese and bake in a hot oven, 450°F, 15 minutes or set under the broiler about 5 minutes until cheese melts and slightly browns. At serving time: Bring to the table bubbling hot and serve from shells or baking dish. Serves 4 to 6. Image: Jan Matulka. 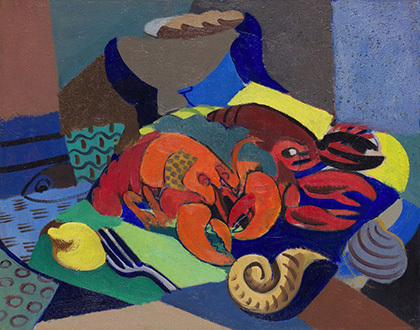 Untitled (Still Life with Lobster), c. 1930. Gift of Mary and John Gedo.